The palace is found in many Venetian landscape paintings including ones by Canaletto and Guardi. It stands picturesquely beside a 16th century Palladio church and a 15th century Codussi bell tower. It is steeped in history with stunning views all around and has multiple places for dining or relaxing with drinks, including the campo the palace sits on, along with private decks and terraces. The palazzo was once the patriarchal church of Venice. Located between The Biennale Garden and the Arsenale, it is a neighborhood for those who desire the quiet Venetian life rather than the hustle and bustle of tourists. Yet you are only a short walk to three vaporetto stops and a leisurely stroll will take you to the center of the Piazza San Marco in under twenty minutes. There are two private water taxis moored at the dock for guests of the Palazzo del Patriarca. GROUND FLOOR:The main entrance leads to the stairs and the elevator. On the right is a small entrance hall, hallway and the main kitchen. A short staircase of four steps leads to the 1,000 square foot cavanna (an ancient boat shelter with vaulted ceilings). The cavanna is also accessible from the main entrance, making it ideal for wedding receptions or business meetings for up to fifty guests. Beyond the cavanna is the gym, with a small bathroom with shower and heated hot tub. Doors open to tiny garden that will grow to a 1,000 square foot garden in 2013. FIRST FLOOR: The elevator or steep staircase will take you to the second kitchen. This is the one you will use during your stay. Also on this level is a dining room, two living rooms and two bedrooms, each with en suite bathroom. Three doors lead to large terrace overlooking the water. SECOND FLOOR: The master bedroom has views over the water and a balcony overlooking the Palladian church next door. The en suite bathroom has a large tub. There are three more en suite double bedrooms on this floor, one with a Turkish steam bath. LOFT: This is ideal for the younger members of the group. Four sofa beds are located here in the mansarda (attic) with sloping ceilings. The loft has an open floor plan and includes a small kitchen with counter that they can gather around for snacking as well as a living room area and a bathroom. 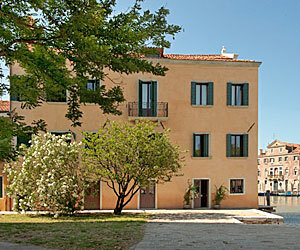 Very steep stairs take you up to the 150 square foot terrace with stunning views over Venice. The main kitchen on the ground floor is equipped to accommodate large parties of up to fifty and can be used for cooking lessons and for daily cooking for guests. Larger parties (for 200 and more) can be organized through catering. The first floor kitchen is used mainly for breakfast but also as support for the main kitchen when guests eat in the dining room or terrace. The loft kitchen is used for serving meals or drinks on the roof terrace.